Armand Gamache sat in the little room and closed the dossier with care, squeezing it shut, trapping the words inside. It was a thin file. Just a few pages. Like all the rest surrounding him on the old wooden floor of his study. And yet, not like all the rest. He looked at the slender lives lying at his feet. Waiting for his decision on their fate. He'd been at this for a while now. Reviewing the dossiers. Taking note of the tiny dots on the upper-right corner of the tabs. Red for rejected. Green for accepted. He had not put those dots there. His predecessor had. Armand placed the file on the floor and leaned forward in his comfortable armchair, his elbows on his knees. His large hands together, fingers intertwined. He felt like a passenger on a transcontinental flight, staring down at fields below him. Some fertile, some fallow and ripe with potential. And some barren. The topsoil masking the rock beneath. "The worst was coming. But so was the best. The snow angels were coming," Gamache reflects in the first chapter. Aside from evoking the chill of November, what expectations do these lines raise about the story to come? What do you think of Gamache's decision to invite Brébeuf to teach at the academy? What does the invitation, and Brébeuf's acceptance of it, say about the two men? In what ways is the map significant to Gamache, the villagers, and the various cadets? What significance does it have for you? How do you feel about the character of Amelia? Did you see the final words in the book coming, and did they change your view of Gamache or Amelia in any way? The author's emphasis on quality writing and character development necessitates more setup on the front end of the narrative. The action doesn't get rolling until perhaps a third of the way in. These sections are so well written that the book never drags – I advise readers to set aside uninterrupted time to read the last 50 pages, as they likely wouldn't want to be disturbed as the book speeds to its conclusion. (Reviewed by Kim Kovacs). Luminous prose, complex but uncluttered plots, and profound compassion. Starred Review. Gamache fans will be thrilled by the way this installment unlocks some of the series' enduring questions: Why is Three Pines off the grid? Why do we know so little about Gamache's past? At the same time, the main plot offers a compelling mystery and a rich human drama. Starred Review. This complex novel deals with universal themes of compassion, weakness in the face of temptation, forgiveness, and the danger of falling into despair and cynicism over apparently insurmountable evils. Starred Review. This riveting read, with characters of incredible depth who only add to the strength of the plot, will keep readers guessing until the last page. For series fans and those who enjoy the small-town mysteries of Julia Spencer-Fleming. Starred Review. A chilling story that's also filled with hope. Louise Penny often includes poetry in her books, and A Great Reckoning is no exception. Throughout the novel, A Satirical Elegy on the Death of a Late Famous General by Jonathan Swift is quoted. He'd wish to sleep a little longer. As by the newspapers we're told? 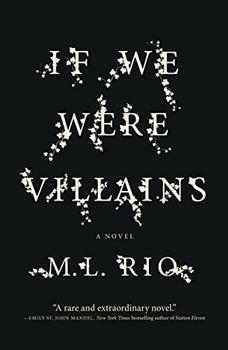 Intelligent, thrilling, and richly detailed, If We Were Villains is a captivating story of the enduring power and passion of words. Written with a wry, witty narrative voice and a plot full of twists and turns, John Keyse-Walker's Minotaur Books/Mystery Writers of America First Crime Novel Award-winning debut is a pure delight.